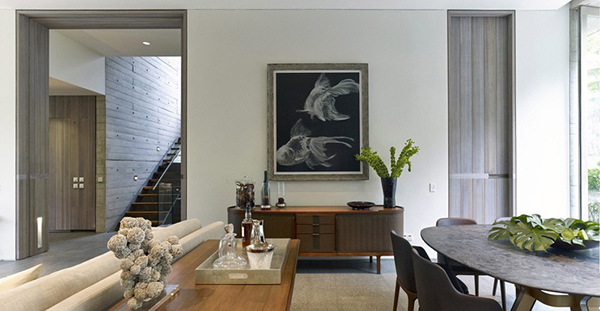 As much as possible, we would always want to connect our home to the environment because aside from a healthy and refreshing aura, our homes become even more beautiful. I know you have seen many homes like this that we have featured here on Home Design Lover and we have another one to add in your list today. Like most homes that we see these days, this also has a modern design. 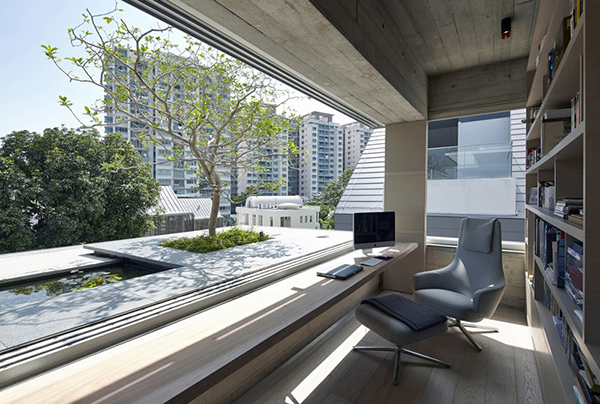 The Chiltern House in Singapore is a family home in central Singapore that is woven around the needs and desires of its inhabitants. It is aspired to be “deeply rooted, connected to the surrounding environment, the history of its development, as well as the family’s lifestyle”. 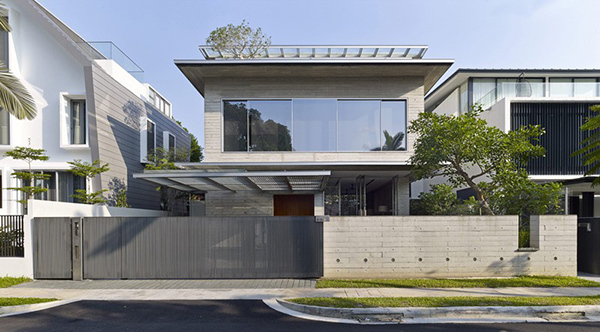 This single monolithic concrete structure is also woven with steel reinforcement and raw timber formwork. 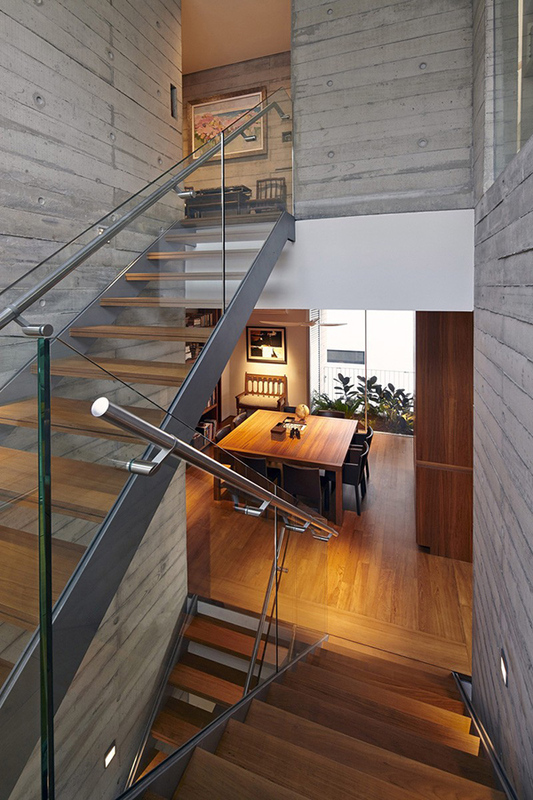 Rugged lines in the concrete is seen while there are also hints of steel reinforcement in the walls and ledges. As for the interior, it is a cozy design with colors that would make us feel relaxed. Come take a look! The exterior of the house shows textured horizontal bands in the concrete where the timber formwork once was. The memory of the construction process is said to mark the passing of time and is a reminder of the family’s effort, desire, and realization of their dream house. The house is articulated around a square geometry in plan. The spatial arrangement of this house is a complex interplay of large and deep spaces. 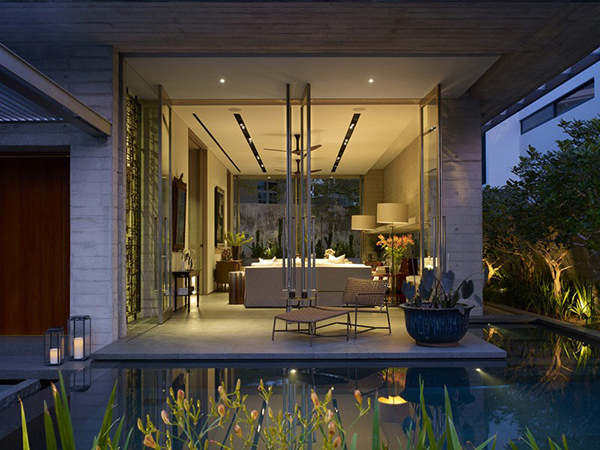 It has elongated rooms that draw the eye across them and would relate to the views of the garden. The living and dining rooms are connected and has a swimming pool at one end and a rear garden at the other. The interior has a mix of materials as well as some natural features too. There is a visual connection in the interior that give awareness to one person to other’s movements within the house. It is strongly linked to its surrounding environment with the use of glass. Even the staircase use glass for the railings too. You can find a low bay window opening that provide an intimate and direct connection to the landscape just like what you can see in this working area. 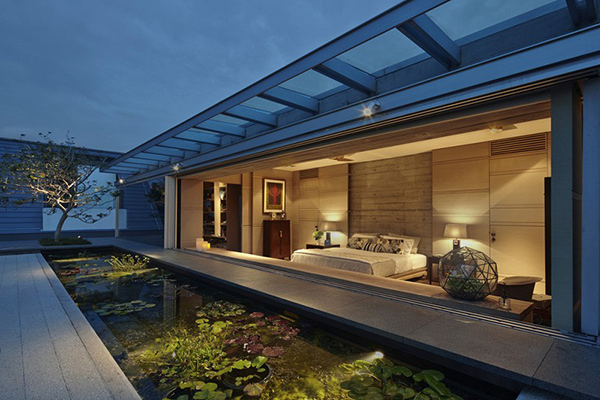 Even the bedroom has that wide window that will let you see the beauty of the outdoor area. 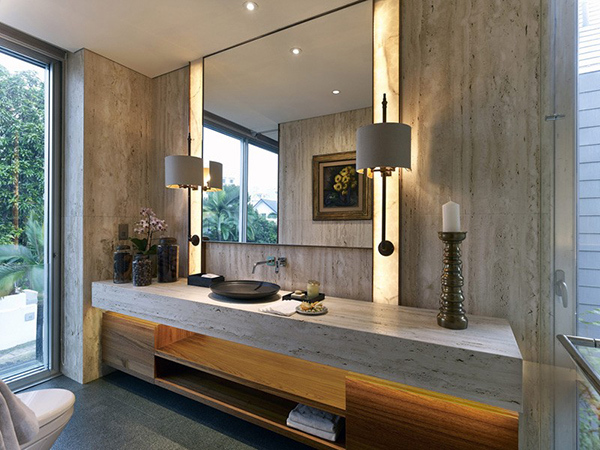 The bathroom looks very lovely too especially with the texture of the walls and countertop. 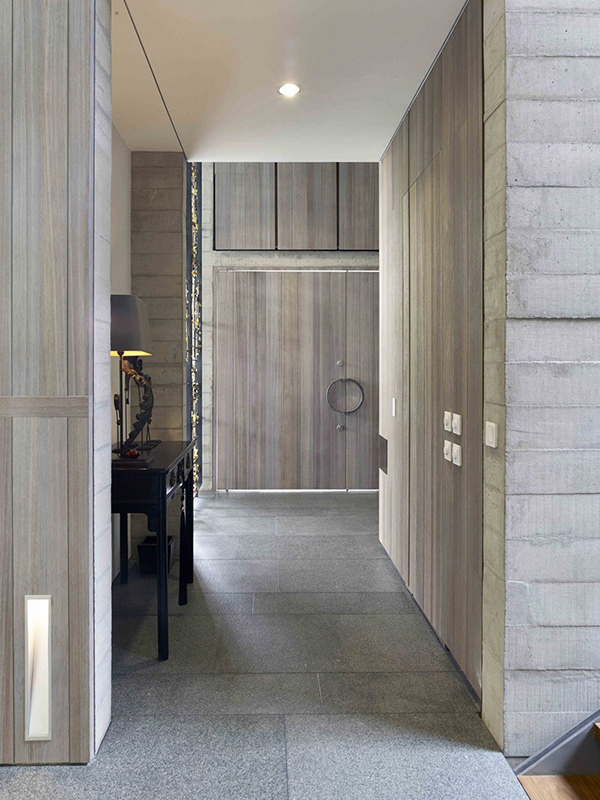 This is the hallway from the entrance of the house surrounded with lovely wooden texture. Note the lines in the concrete too from the formworks used for it. 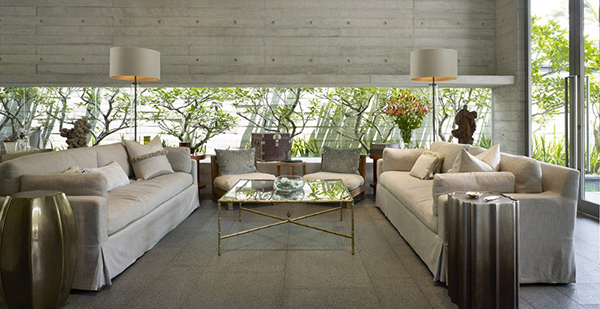 The spaces of the house are designed for the dwellers to enjoy their own privacy and commune with nature. The spaces would also allow them to meaningfully come together in the creation and continuation of family rituals around meals, greetings, and homecomings. So, what can you say about this house and its connection to the environment? Isn’t it lovely and just totally relaxing? 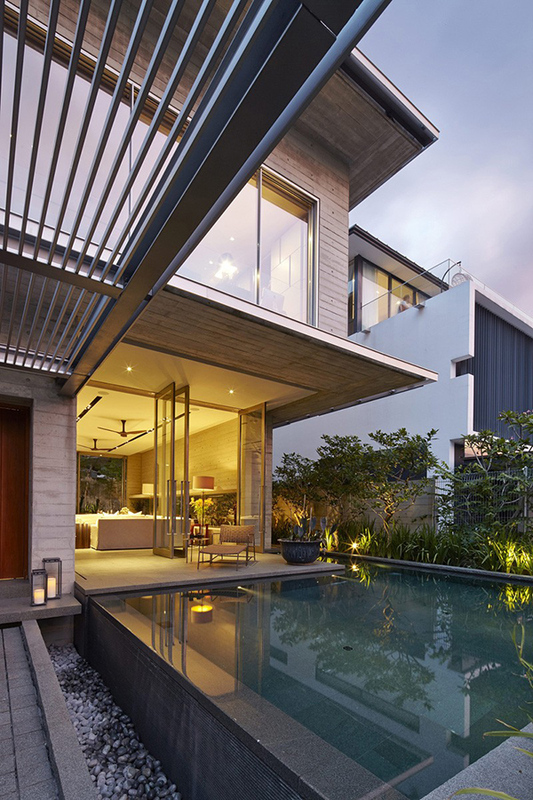 This beautiful home in Singapore is designed by WOW Architects/Warner Wong Design and I would say that this is an astounding house design both inside and out.